You Get What You Need | Sprezzatura, Y'all! I woke up this morning with 7,000 steps on my fitness tracker. No, I didn’t have a restless night or make many trips to the bathroom. Let me explain. After we had planned this trip we found out the Rolling Stones would be playing in Lucca, which is about two hours from Anghiari. We really wanted to go, but tickets were scarce and pricey, so we decided against it. Well, I thought it would be nice to surprise Steve for his birthday on July 4 with tickets. So my friend Michelangelo helped me track some down. He found someone who had two tickets and a hotel room for sale for about as much as we spent on one of our plane tickets. I swallowed hard and reminded my frugal self countless times that you only live once and how could we miss this incredible opportunity and sent the money off. Well, even that involved an elaborate plot. Steve and I have a joint checking account and I couldn’t figure out how to sneak the money out without him knowing about it. So my dear friend Julie agreed to wire this not inconsequential sum to a strange man in Italy that neither of us knew. The whole thing could have been a scam, but Michelangelo knew the guy so I felt a little better about it. On July 4, I wrote a little poem for Steve (plagiarizing heavily from the Stones) telling him we were going. His jaw dropped and his smile grew and I knew I had done the right thing. We got the tickets and the hotel room voucher when we got here and we were set. Steve has known Georgia’s own Chuck Leavell for many years (he’s been the piano player for the Stones for decades) and he emailed him and told him there would be some Georgians in the crowd in Lucca. He hooked us up with passes to a VIP reception before the show. Only thing was we didn’t know how to get the passes. We emailed him a couple of days before the show and didn’t hear anything back. Not wanting to pester an international rock star, we just let it be. As we were driving to Lucca, Steve got an email from Chuck saying he had us covered and we needed to pick the passes up from his hotel in Florence before 2:00. As luck would have it, we were driving on the autostrada through Florence at that very moment. It was about 1:00 and we wondered how we would ever navigate through Florence to find this hotel and get these passes within an hour. Google Maps to the rescue! He was at the St. Regis, right on the Arno in the heart of Florence, and we got there with no problem in about 20 minutes. We pulled up right in front of the hotel, along with about 15 very black Mercedes’ with very black tinted windows in the back, and parked our little Fiat 500. Well, at least it’s black. The doorman told Steve that we couldn’t park there. Steve said he would only be five minutes and the doorman said if Steve gave him one euro it would save us a 300 euro ticket. Steve gave him two. In five minutes we had the passes and we off again to Lucca. By the time we got to our hotel, everything was closed for afternoon siesta, including our hotel. That’s right, there was a sign on the door that said “Oggi Completo”, or Today Completed. What did that mean? We called the number on the card and a man said that he would be back at 4:00. So we tried to find a spot for lunch and found that everything was already closed for the afternoon. That’s one of the most maddening things about this country that relishes food above most all else. You have to eat between about 12:30 – 2:00 for lunch and from about 7:00 – 10:00 for dinner. Forget eating in the middle of the afternoon. We finally found a little pizzeria that was open and gobbled down a sandwich. Then to our hotel. True to his word, the man showed up at 4:00 and we checked in. There was a group of young Italian men waiting to check in as well and it turned out that one of them was the guy I bought the tickets and room from. There were four of them and as nice as they were, I couldn’t help thinking that I had paid for each of their tickets and rooms and probably their gas money and meals too. The hotel. Well, let me try to focus on the positive. It was very clean. It was about 2.5 miles from the center of Lucca, and it was right across the street from a shuttle bus that took you right to town. So not a horrible location considering every hotel room within about 50 miles was booked. The room was tiny with very crappy furniture and the tackiest curtains I’ve ever seen. And no bathroom. We walked in and I opened a door to what I thought was a bathroom and it was a closet. The bathroom was just next door and was communal with the room on the same hall (two of the guys whose trip I paid for). It was a nice bathroom, and again, very clean, but sharing the bathroom with three guys (one of whom was my husband) was not appealing to me. We agreed to pull out first thing when we woke up the next morning and shower back at our apartment. So my bathroom experience was limited to brushing my teeth and washing my face, and, of course, using the toilet. It wasn’t so bad and it made me feel like a materialistic American to think that I was above sharing a bathroom. But I did feel that way. We took the shuttle bus over to Lucca (3 euro round trip each – I paid for that for the boys, too) and it was great. I was so glad we didn’t have to worry about driving and parking and crowds and lines. This smug thought would come back to haunt me several hours later. We walked around town a little. Lucca is a beautiful town and is well worth a visit. But it was insane on this Saturday evening. 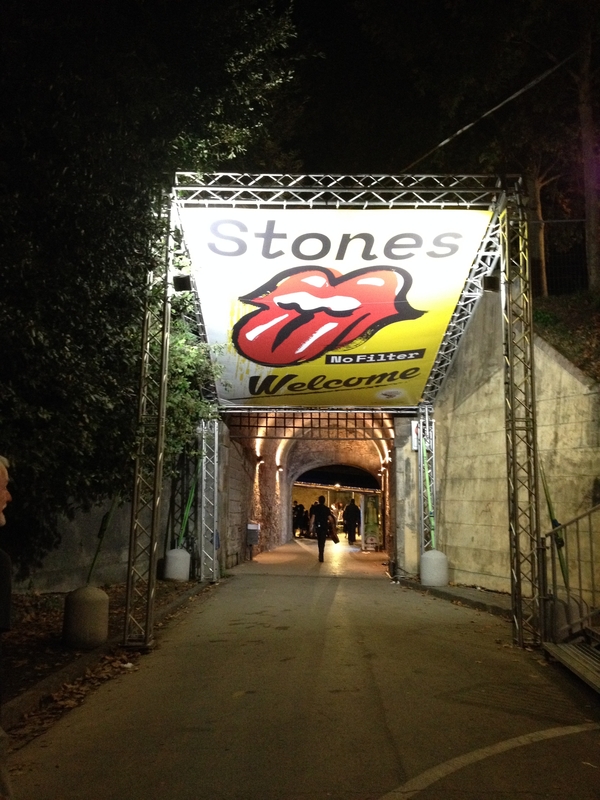 Rolling Stones stuff was everywhere and the town was mobbed with concertgoers and hangers on. We made our way to the VIP reception which was in a gorgeous palazzo with an internal courtyard. We got there early because I was determined to spend every single second I could there. I’m glad we did. It made our meager hotel room with no bathroom seem like a distant (and very incongruous) memory. It was privilege and excess at its finest and I must say I loved it. Champagne, wine, beer, food, desserts, espresso – you name it. We even got a party favor – a little thing you wear around your neck that holds your wine glass so you don’t have to juggle it and your plate. Those cleaver Italians! We met some fellow Georgians – friends of Chuck’s – and chatted with Chuck a while. Ron Wood and Charlie Watts also made an appearance, although we didn’t get to talk to them. Not sure what I would have said anyway. Something I’m sure they’ve heard 10,000 times before. It was a delightful evening in a beautiful place and we felt honored to be there. Thank you so much, Chuck Leavell! On to the concert. We walked through the city and around the back of the stage to get into the concert. The first place we tried they said, no go over there. The second place we tried, they said no go over there. Then we ended up on the street. Yes, the street. There were mobs of people on the street alongside the park where the concert was. We thought they were just getting a free show, but in actuality that’s where our tickets were! It was an incredible mob and you couldn’t see ONE SINGLE THING! We went back to one of the places that had turned us away before and tried again, thinking surely we couldn’t have tickets on the street. On the way to the ticket taker, I asked Steve how much money he had. When we got up to the guy, he looked at our tickets and pointed back to the street until he saw the 50 euro bill on the tickets. Then he waved us through. We ended up being about 50 feet from the right end of the stage. Standing room only, but not bad. Of course, I couldn’t see a thing, being the vertically challenged person I am, but once the concert started and people moved around and went for beers we worked our way up to the front and I was right at the rail. Perfect! 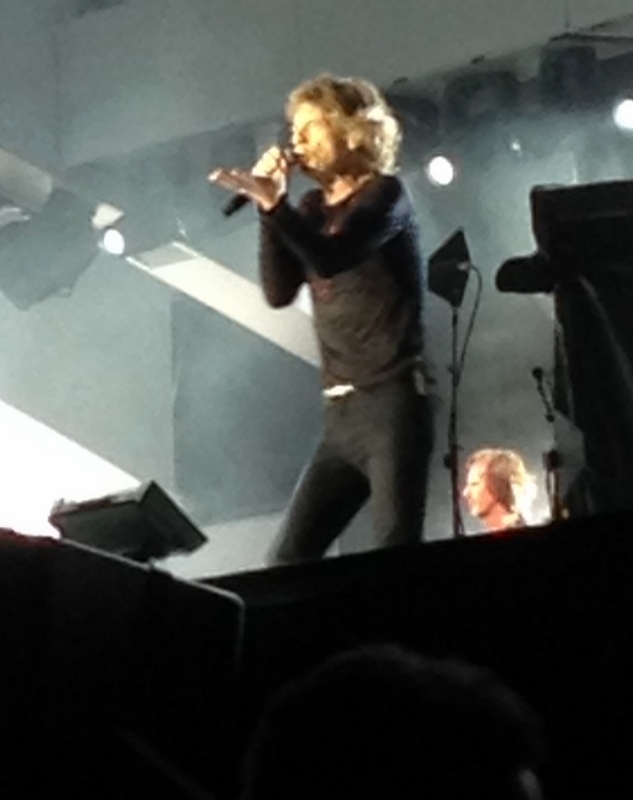 The concert was wonderful – Mick Jagger is a freak of nature. 74 years old, eight children (one not even a year old), five grandchildren and one great-grandchild. This is not a man who sits around and counts his money. He actually still works for it. I’ve seen the Stones three other times, but this time I was amazed at this man. He is still the same as the first time I saw them decades ago. How is this possible? Oh, his face is craggy and aged, and I’m sure he colors his hair, but his stamina and energy are incredible. To borrow a line from “When Harry met Sally”, I’ll have what he’s having. What has made him so robust? Whatever it is, I hope he keeps it up. He needs to see that not quite one-year-old son grow up. After the concert. Well, let’s just say getting through the throngs of people back to our bus stop was difficult. Filthy (I hate to think about what I stepped in), inching along with a sea of humanity in every direction, the smell of spilled beer and other things I tried not to think about, feet being stepped on, body being jostled – it was a mob. I can see how people get trampled and killed in these soccer game frenzies now. I thought if for some reason you fell, too bad. You would be crushed. When we finally got to our bus stop, the line was about three blocks long. And the buses – they were the little motor coach thingies, not MARTA buses. They held about 25 people. At that rate, we figured it would take about two hours or so for us to even get on a bus. Not a cab in sight. So we walked. Two and a half miles at midnight. Navigated by Google Maps on my rapidly dying phone. It even started raining on us at one point, but mercifully it stopped after just a few minutes. We finally got to the hotel and fell into bed at about 1:30. My feet hurt so bad I couldn’t sleep. I heard the boys next door come in at about 2:30 or so and I wondered if they had waited on the bus or had just gone out partying. They went right to sleep whatever it was. And that’s why I woke up this morning with 7,000 steps. My fitness tracker starts over at midnight. Heck, if Mick Jagger can strut around a stage for two and a half hours, I can walk two and a half miles after midnight.